Good advice...especially when a story can kill you. Bloggers and journalists have discussed at length the sudden popularity of serial novels, and not succeeded in finding a reason for it. Serial novels have a long tradition, but for a time it seemed that they were almost forgotten. Dating all the way from 19th century, they played a monumental part in creating the so called popular literature. In other world, they helped books find their place in the popular culture. From what I've been able to find out, Penguin and St. Martin's in particular seem determined to give serial novels a new life. But it wasn't until both Ilona Andrews and Seanan McGuire wrote theirs that I started believing this project would actually succeed. 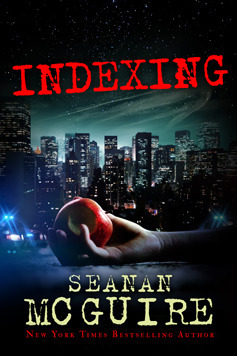 Indexing was first published in a serial format on Amazon. The readers paid for the whole thing right away and downloaded a new part when it became available. Since it wasn’t available to international readers at first, I had to wait for the completed novel to be published, for which I ended up being thankful, since I’m not known for my patience, and the story is very compelling. Don't mistake Indexing for a fairy tale. That's not at all what it is. Instead, it's a story about sentient, malevolent narratives. As for the characters, McGuire took the whole concept of archetypes and built upon it, using her vast knowledge on fairy tales (and literary theory) and combining it with extraordinary imagination to turn old stories into something we've never seen before. Whatever Seanan McGuire writes (be it under her own name or as Mira Grant), has her trademark combination of extensive research and wicked sense of humor. Worldbuilding-wise, Indexing is perhaps one of the most interesting things I've ever read. Like most of McGuire’s novels, Indexing is cleverly subversive, serving a healthy helping of social activism with the already interesting story. McGuire always makes her point, but never in a way that could make her readers uncomfortable. Her messages are subtle, but clear, whether they’re allegories, or straightforward (in this case, the point was made through a very sympathetic transgender character). Indexing is a product of superb intelligence and vast imagination, and as such, it’s worthy of your time. It pushes the boundaries of its genre, and it certainly pushes readers to expect more from genre fiction. This sounds like a very interesting concept - storybook narrative in real life. I can't help but be curious about what the author meant by it. Honestly the cover didn't draw my attention at all, but I think it's worth a try :) nice review Maja! I like the sound of this one! I've never read a serial novel, but I can see the appeal, especially for people that don't have a lot of time to read. I think I'd like having it all together to read all the way through though. I am not a fan of serials so I wait for them all to come out. Now I will have to check this out. I'm not familiar with this book, but I'm so glad I read your review. I love the idea of serial novels too, although the last one I read was way back before the internet, one by Stephen King. I'll be adding this to the tbr pile! Oooooh, this sounds super interesting and I do think I'm adding it right away to my TBR list! I've yet to pick up something by this author and I really should since you highly recommend her. I'm not a fan of waiting for series especially with all the rise to trilogies in YA so I'll wait for the whole thing to come out in order to pick this one up but it sounds fantastic! I do love Seanan McGuire. She's gritty and really draws me into her worlds. However, I'm still not sold on serials. I've started waiting until all the parts are out to get them or get them as they come out but not read until the story is complete. I hate waiting. I haven't read this author yet and still haven't read an actual serial. I'm not sure if I'd like them or not, though I like the idea of getting through something quickly, I hate waiting for more. I was so curious about this one, I'm a big fan of Seanan Mcguire but I don't like books in epsiodes I confess, I don't have a good memory for it. I'm glad you enjoyed that much, now I really really want to read it too! I hate serials. Not a fan at all (if you haven't guessed), but now that this one is all together... I'm all over it. Yes, I do think I will get this one. I love her characters and this one sounds good in that way. Also love a good worldbuilding. So glad this one has it in spades. It would be hard to wait for serials to be published, so I'd probably be happy to wait for the final book. I know you love Seanan's books, and I like that her messages are subtle, not pushy. I've never heard of this book or this author before, but it seems like I'll have to check this out! Although I'm not a fan of serials, this synopses has got me curious. "Indexing is a product of superb intelligence and vast imagination." Yup, definitely interested. Lovely review, Maja! I am not the most patient reader either Maja, so well done for patiently waiting for this book to become available. It sounds like McGuire really does push the boundaries with this book and ends up delivering a brilliant read! Thank you for putting it on my radar! I know what you mean about a serial. I read one by Suzanne Johnson earlier this year and I was glad that she sent me the whole thing, it would have driven me nuts to wait for it, yet there is something fun about having a new installment to look forward to every week. I still need to read something by this author, I have scheduled her upcoming Sparrow's Road on my blog. Fingers crossed! Wow this book sounds amazing! I will certainly add it to my looong list of books to be read! ha.. interesting, very different. Glad to hear that her messages aren't pushy,as this sounds like a curious read. I didn't realize she did a serial novel. I've missed this one. I've read a few serial novels, and even podcasted novels, and love it! It's nice to have something to look forward to each week. :) Thanks for sharing this one. We should be book sisters..I loved this one. Here is my take and stance on serials. I totally love and enjoy the ones like McGuire's where you pay one fee between 1.99 and 3.00 and each week for 8-10 weeks on Tuesday a new episode is downloaded. I have read several and loved them. Here is what I cannot stand and refuse to support. .99 cent installments that are 40-87 pages long, that release every month or so and drag a book out until the author/publisher has bled more money from you then the cost of a hardcover new release. Yep..won't do it.